Work week lunches drive me bananas because I get bored so easily! 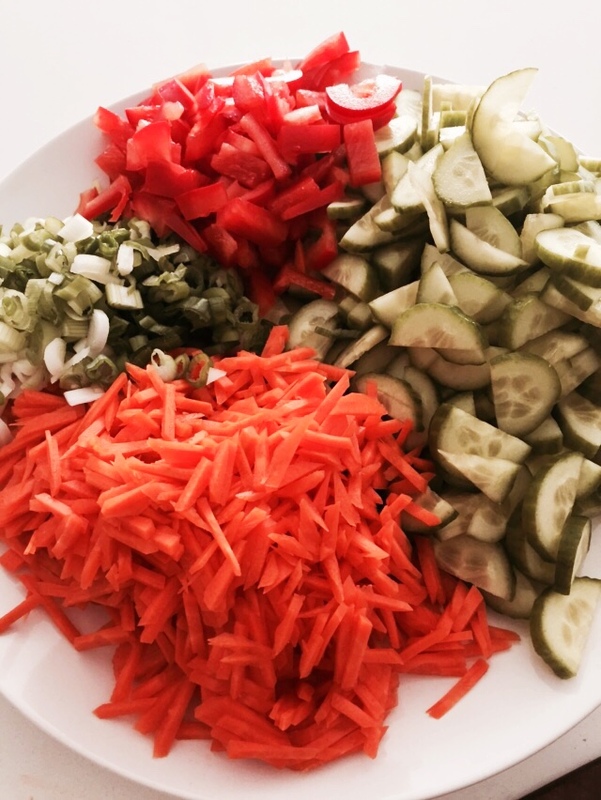 Here’s what I have learned along the way…If you prep in advance, it goes a long way to eating a healthy and delicious lunch no matter what kind of things are going your way. 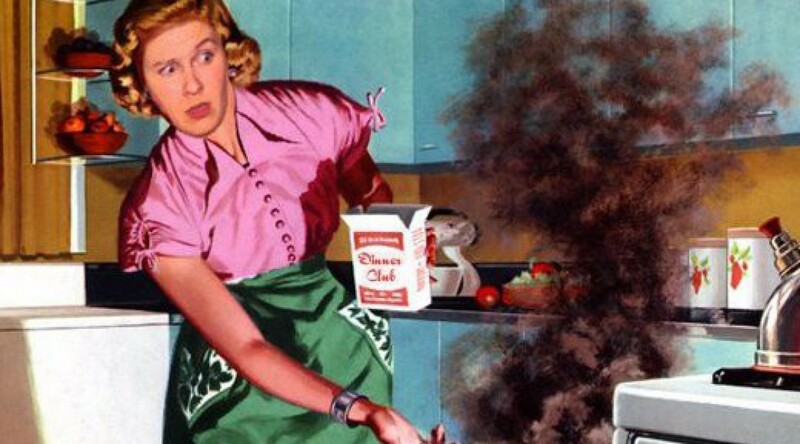 Seriously…10-15 minutes of prep time can actually end up saving you TONNES of time throughout the week and you can end up feeling pretty awesome about how amazingly prepared you actually are. 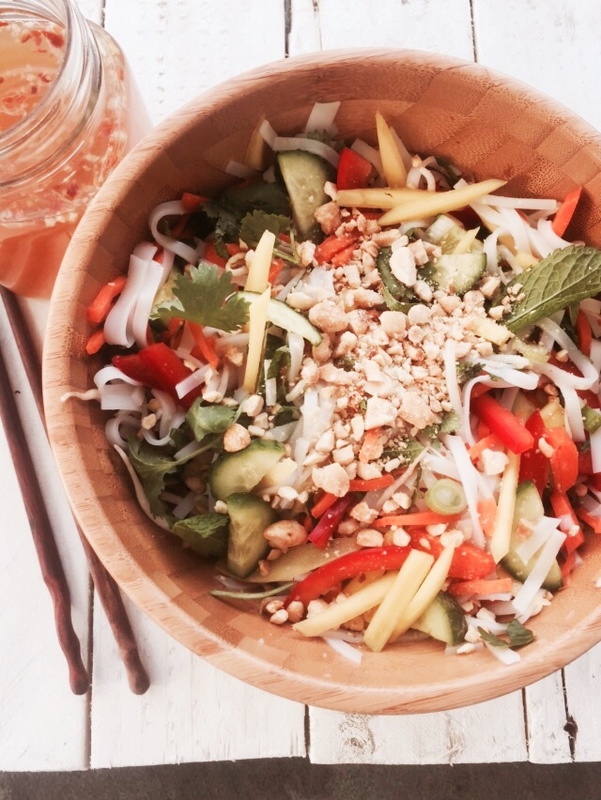 A little salad I like to make that holds up all week long is my vietnamese noodle salad. This baby can be made with a variety of veggies that you have in your fridge and you can either keep it vegetarian or add a meat protein…totally your call. The dressing is pungent, tangy, sweet and sour all at the same time and the absolute show stopper of flavour maximus is mint. In addition to an amazingly simple dressing, all those veggies…it features rice noodles which are super easy to prepare and require NO COOKING!! That is a score in itself!! First you want to get your rice noodles going. All you have to do is take them out of the package and place them in a large bowl. I typically use a half of a package and that makes enough for the entire week. It’s also a large enough portion to bring to a pot luck or to bring to a summer barbeque for something a little different that the usual bbq fare. I usually boil the kettle and then once it’s boiled, I pour the kettle over the noodles and let it stand for a few minutes. 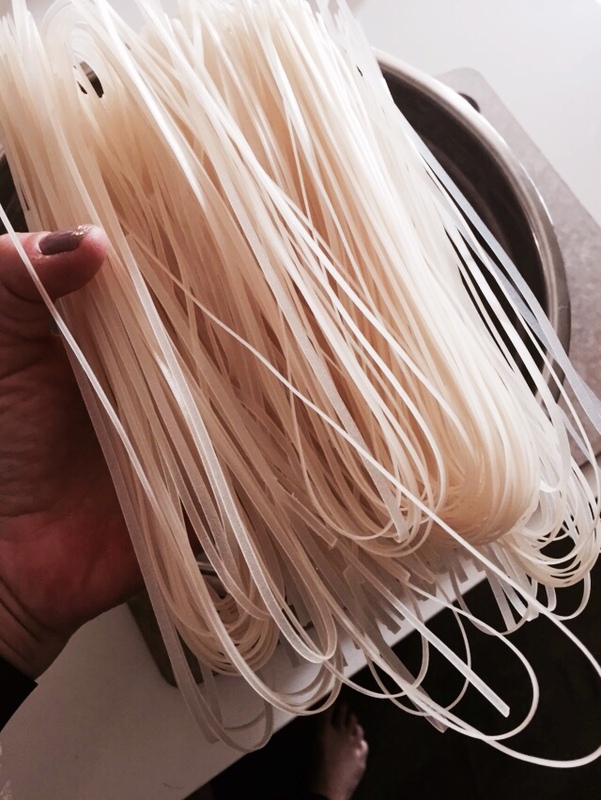 It should only take a few minutes but the rice noodles will become pliable and ready to go. I usually taste one to make sure they are soft enough. *Confession…try a few!! I once tried one and thought, they are good and I drained them and went on my merry way. Later on when we were eating dinner…I noticed…oh they are a little more than al dente. Bit hard for my liking. So the moral of the story here is TRY A FEW NOODLES JUST TO MAKE SURE!! Once they are soft enough, drain the water out of the bowl and then put the noodles back in a bowl of really cold water. This will stop the noodles from cooking and they won’t stick together. You know when noodles just get gross and all stuck together…it’s annoying. The fastest way to correct it is to rinse them under cold water again…voila. Drain the cold water out of the bowl and set the noodles aside. *Note: You can keep the noodles really long for the salad or cut them in to more bite size pieces. To be honest, I find the smaller pieces easier to eat…so I usually just take my kitchen scissors and cut them in to strips about 1 inch long. Next you want to cut up what ever veggies you want. 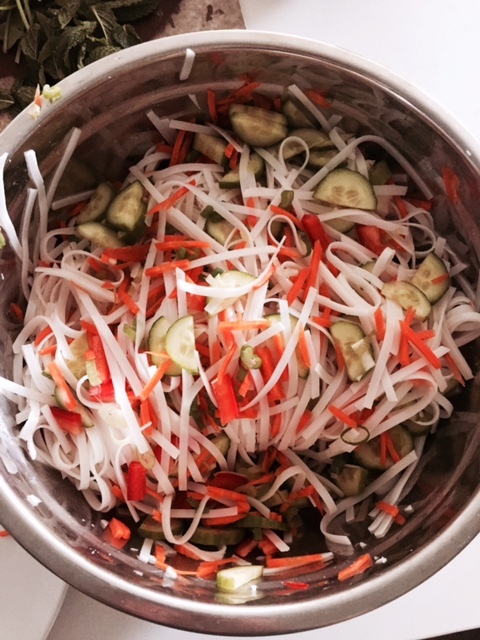 I typically use a variety of cucumber, carrots, bean sprouts, green onion, under ripe mango (which tends to be a bit sour), red peppers, mint and cilantro.It looks like a lot of chopping but seriously, it goes quick and I like to use tools like a mandolin or a julienne peeler to make it quicker. Add the veggies/herbs to the noodles and mix together. If husband is not eating this, I add at least 2 Tbsp mint and Cilantro because it really really adds that fresh flavour to the dish. Don’t get me started on his disdain for herbs (Rookie!!). If you are adding a meat protein such as chicken, beef or pork, go ahead. If you want to take this in individual portions for lunch, I suggest not dressing it, take the dressing on the side or the cucumbers will lose a bit of their crunch. I have taken left overs from my dinner salad and it has been delicious the next day but its totally your call. Definitely take the peanuts on the side or they will be soggy the next day. For making the dressing, it’s actually super simple. Add all of the ingredients (Fish Sauce, Lime Juice, crushed garlic, sugar and warm water and a wee pinch of chilli flakes) to a jar with a lid and shake or stir it until the sugar is dissolved. The key to this is adding warm water so that it helps to dissolve the sugar. This is one of those dressings that you shouldn’t be too concerned about the ratio. A little more of this or that and it all works out in the wash. I make full jar batches of this and I just play around until it tastes good. 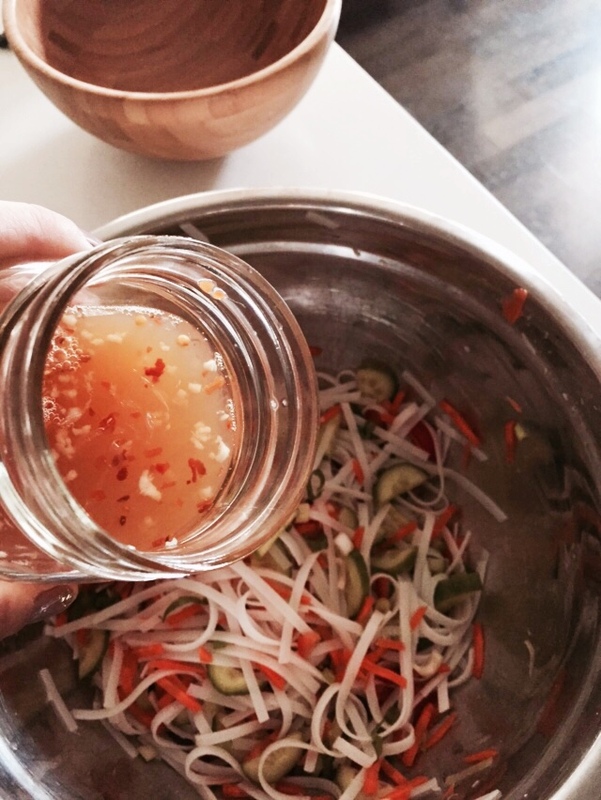 If you find that the fish sauce is too much for you, just add more water to balance it out. Pour as much of the dressing as you would like over the Salad until it is well coated. Serve in your favourite serving dish and then sprinkle the top with crushed peanuts and a bit more herbs if you would like. Serve and get ready to be the envy of all of your work colleagues!! That dressing tho!! So simple and soooo delish!! 1-2 Tbsp chopped cilantro and chopped mint (chiffonade that baby). *Seriously though, sometimes I make big batches of this dressing and just keep in a jar in my fridge. I just play around with the ratios until it tastes great. A little more lime, fish sauce…its totally your call on what your taste buds like!! Make the dressing by adding all dressing ingredients together and making sure to stir until the sugar is dissolved completely. I usually do this in a measuring cup and then pour in to a jar with a lid and let sit in the fridge until I am ready to use it. Mix rice noodles, herbs and veggies together in a large bowl. Portion the mixture for lunches in containers and then pack desired amount of dressing to go for each portion OR just pour desired dressing amount over the noodle salad if serving a big crowd. Top with crushed peanuts and serve. I hope you all like this lunch time hit or decide to take this to your next pot luck because it’s always a good one.